The League officially began operations in March 1954, and games were played on a field on what is now the Nottingham Fire Co. parking lot. There were four original teams with about 60 players total. One of the original sponsors, and remaining one until 2009, was Patterson Chevrolet. The following year the League moved to its present location on land that Hamilton Township had acquired from Frederick Sayen, owner of the Mercer Rubber Company located in the brick building seen in the background. Nottingham's first State Championship team is seen in the top photo from an August, 9, 1969 newspaper story. 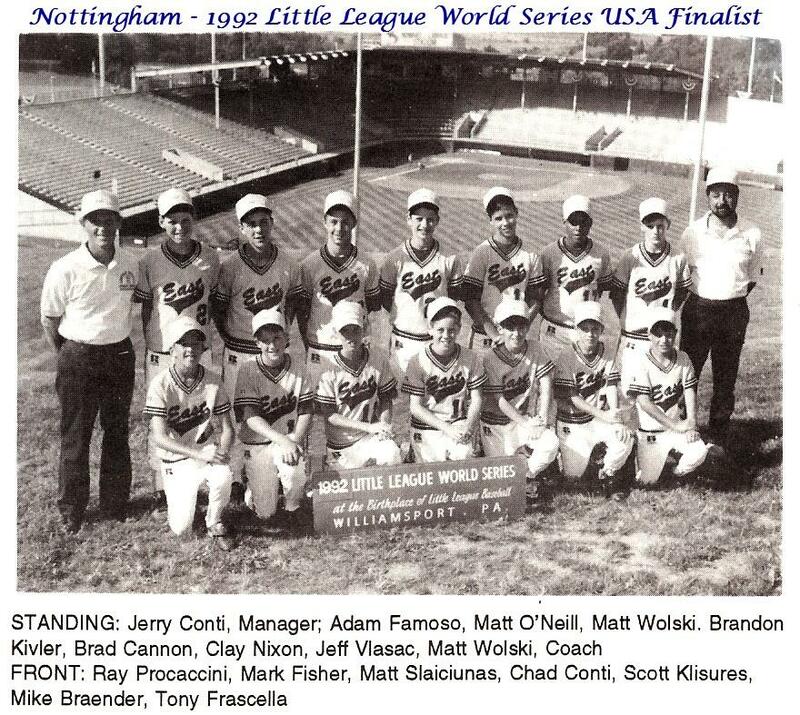 Below is the 1992 team which reached the USA final round at the Little League World Series in Williamsport. In 1993, John Tedder, a long-time Nottingham supporter, wrote a history tracing the League’s beginnings from 1954 through 1992. The District team had just come off a fantastic season in 1992, having reached the Little League World Series as a US Finalist. It was written as the League was approaching its 40th anniversary and was published for several years in the League’s Yearbook. Mr. Tedder now resides in upstate New York and is happy to see its revival here on our website. He is still active with the keyboard with a blog http://www.teddersrandomnotes.com/blog/ where he sometimes recalls his days in Hamilton Square.